When Arduino is used for robots or interactive media, digital IO port is always found not enough? IIC now turn I / O modules to help you solve the problem, Arduino only two data lines (SCL-Analog PIN5, SDA-Analog PIN4) and IIC can transfer I/O module communication, to convert the 16 digital IO ports, read-write. 8 simultaneous parallel modules, each module can be set to address. it's a great little expansion board that can be used to drive LEDs or anything you want. My biggest problem was figuring out the I2C address of the PCA9555. Jumpers make the address 1 0 0 '0 0 0'. This is opposite of what I expected. //  with no jumpers the full address is   1 0 0 1 1 1    1 0 0 A2 A1 A0  0x27 is the default address for the DFR0013 board with no jumpers. #define PCA9555 0x27 // 0x27 is default address for the DFR0013 board with no jumpers. // 0x20 is address for the DFR0013 board with all jumpers. // If relays turning on during power up are a problem. Add a pull down resistor to each relay transistor base. Let's see a practical example: Driving a 4*4 button pad with GPIO. Hardware preparation: a 4*4 button pad, a GPIO, 4 1k Ohm resistors. sample code for Sealed membrane 4*4 button pad with sticker, it outputs the ASCII code for keys on the pad. and determines whether there is a signal input( pression on the keypad). between 0-1023. It will be impossible to determine whether the connection is made by pressing the button on the key pad. 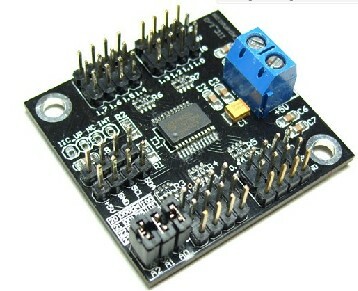 Get Arduino I2C to GPIO Module from DFRobot Store or DFRobot Distributor.